Dependable towel and apron rental service – reliable pick-up and delivery. Maintaining commercial towels and aprons is not as simple as throwing them in a regular wash. Towels and aprons used in manufacturing, restaurant and food services, hospitals, medical institutions, and many other industries don’t just get used heavily; they also get exposed to difficult stains including ones that are potentially hazardous. It takes a truly skilled and experienced company to handle these types of linens and it takes a company like ours to deliver the best towel and apron rental service with ease and convenience. Our company offers a continuous supply and regular maintenance with pick-ups and deliveries at the most competitive prices. – Clean towels are used more often and collect more soil. – Safe disposal for hazardous materials. – Towels are delivered and picked up regularly. – Complies with OSHA and industry regulations. 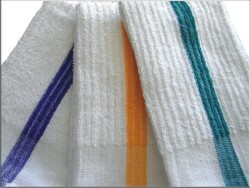 We offer a variety of towels to cater to different industries. These towels come in different sizes, fabrics, and colors to specifically match any business type. The towels are high-quality and made to last even the most demanding industry use. We offer rentals of commercial-grade aprons for food service establishments of all sizes. 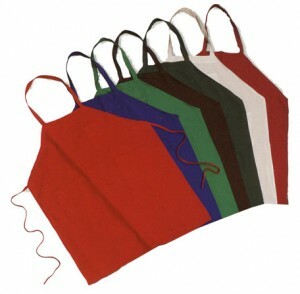 These aprons come in different colors and are made of high-quality spun polyester weighing 7.2 oz and of 32” braided ties.